Most people looking for home theater seating are surprised to hear that there are options available in fabric or synthetic leather. 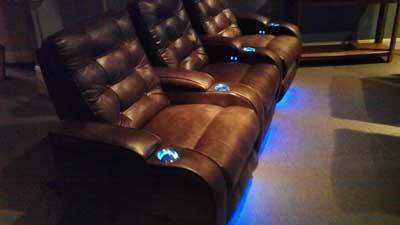 The dominance of black leather in home theater has obviously had its impact. There are other options!! Many of them look even better than leather - and I have been in this business for 4 years now so I have seen a lot of leather. Every once and I while I get to see a seat that proves my case and point. So enough said. Here it is. The Berkline 45035 Embassy. This is a brown leather looking microfiber that took my breath away. This seat has the beautiful tufted seat back and sides and also lighted baserails and cup holders. The other valuable feature here is the arm rests that slide back and forth to hide the cup holder. This combination was a real winner and a must for anyone considering not going with leather. Though some people consider choosing fabrics for their home theater seating, the leather still has some practical sides to it. I think leather is the easiest to clean compared to fabric and microfiber, but also the most expensive, I think. However, I think microfiber has a soft and uniform feel which attracts customers and convinces them that the seats are comfy! I would go for a microfiber but then this is a matter of personal preference.